When we think of the colonization of Africa, the British and the French are the key empires that first come to mind, followed by the Portuguese, Belgians, Dutch, and Germans. In the Scramble for Africa, Italy was not considered a key player in comparison to other major European powers. Italy did come to occupy Libya, Somalia, modern-day Eritrea, and later on Ethiopia briefly (although Ethiopia can boast to have had the only army to successfully repel an European force, the Adwa victory in 1896). As a student of Nigerian history, I have spent the last several years analyzing the nature of British rule in West Africa, especially in comparison to the French style. An overly simplified description would be that the British were comparably hands-off, I emphasize comparably, preferring to use indirect rule by bribing local chiefs and maintaining pre-existing structures of indigenous rule. France however took a more top-down approach, centralizing its governments in Africa using officials from France, ousting local rulers, and imposing oppressive law known as Indigenat. Since arriving to Florence to write my Niger Delta findings, I have spent more time thinking about how a European power could have been comparably less successful in its attempts to colonize African territories. Italy is an example of this. At lunch with a noted Italian historian yesterday, I asked, “Why was Italy so poor at colonization?” His answer was direct, that Italy simply arrived too late to the colonization game to be able to compete with the firmly established empires that were already occupying most of Africa. He emphasized that Italy did not become united as a country until 1861, and by then European colonizers had already been exploiting African peoples and resources for centuries. At this time Italy barely knew how to govern itself, let alone far away foreign lands. I would add to his account that there was a resurgence in the idea of an Italian Empire during WWI, a war during which Italy secured its stronghold in Libya particularly. There existed a popular rhetoric of nationalism, in which interlocutors described Libya as still part of the ancient Roman Empire, and by extension of that as being part of Italy. Giovanni Pascoli, a great nationalist writer, stressed the importance both in his written works and speeches of forging an expanded national identity through conquest and praising of the proletariat. Yet still, Italy could never quite “catch up” with other Europeans in the colonization of Africa. 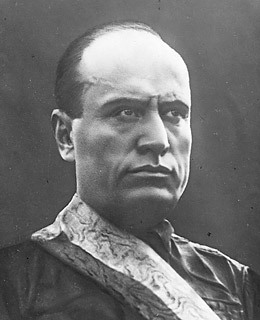 Mussolini‘s regime sought to regain a foothold in Africa starting in the 1920’s, and did so with his conquering of Ethiopia 1936, when he declared an official “Italian Empire.” However, WWI had depleted the resources of the Italian government and Mussolini failed to understand realistically what was necessary to successfully maintain rule over African colonies. It was only a matter of time before his fascism was brought to an end, and WWII created such reverberating changes in the European-African relationship that Italy essentially no longer had any power in Africa by the end of the War. There is a bridge in Addis Ababa that I have heard about which has Mussolini’s inscription on it, essentially marking it as his future domain. Absolute power corrupts absolutely, and apparently makes rulers have totally unrealistic goals for their conquests.